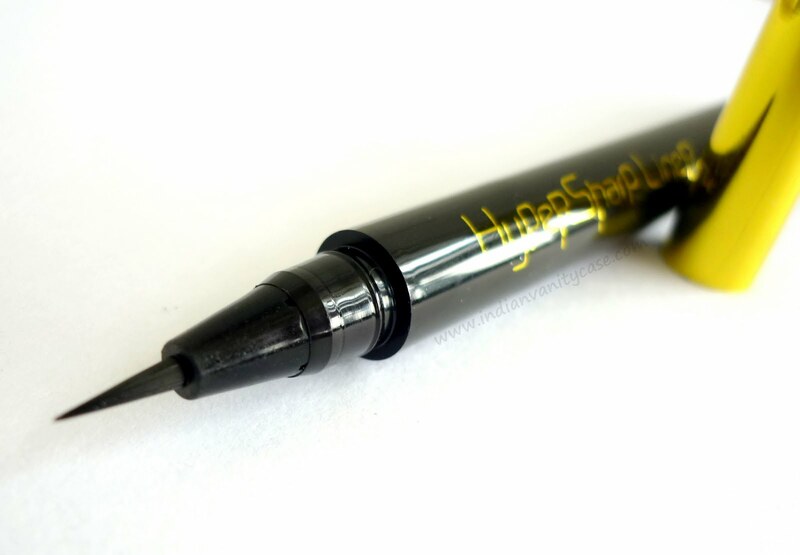 Indian Vanity Case: Maybelline Hyper Sharp Liner ~ .05mm Tip! Maybelline Hyper Sharp Liner ~ .05mm Tip! I just liked 1 liquid eyeliner in the past, and that's the Loreal Super Liner with the felt tip brush. It was the only liquid eyeliner I used. 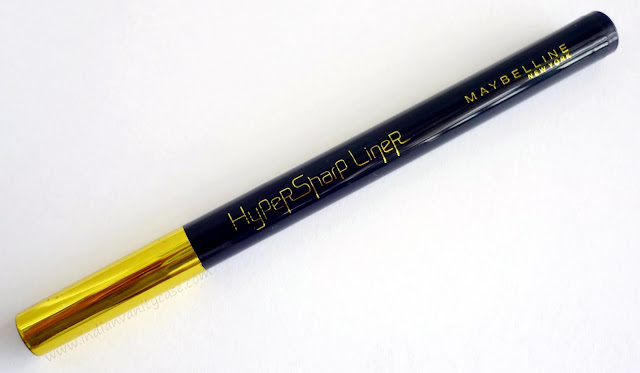 Maybelline Hyper Sharp Liner! A ultra-fine liner with a .05mm tip. It's very black & waterproof- hence, long-lasting. It also didn't burn/irritate my eyes or anything when I applied it close to my waterline. It is sooo....easy to use! I wish they make them all that way. I saw it in Cleo Magazine, decided I must have it & got why the salesgirls at Watsons had doodles with liner and glitter on their eyes. Availability ~ I bought this from Malaysia, so don't know if it'll be launched in India. owheeee, i love this blog!!! I really hope they lauch this in India too..its so good. Love the way u did ur eyes. wow, i want to have this..
let me see if we get it here!!! 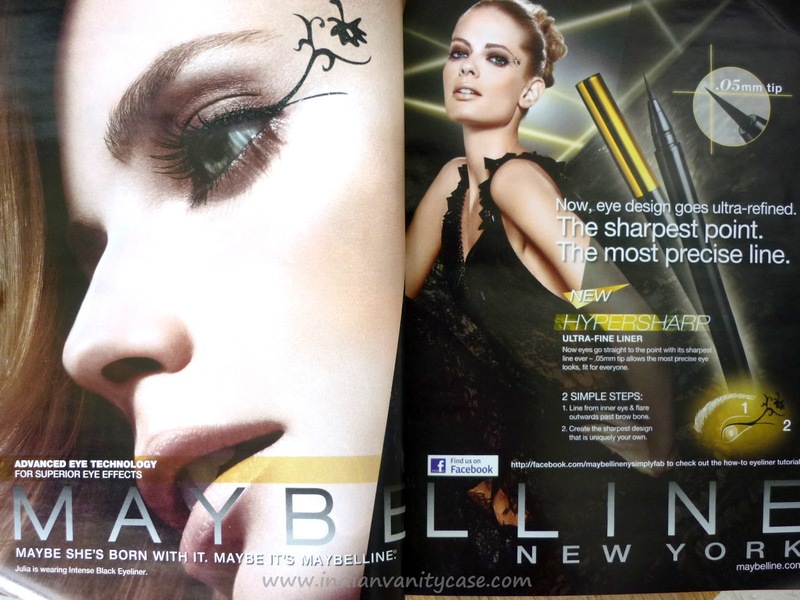 Wow this looks hyper good!, I wish Maybelline would more sync their product launches in India with rest of the world.Most of the great Maybelline don;t hit Indian shores for ages. I've just came across your blog today but I think I will come back again!!!! k, i am buying this! i'd like to try thin liner! Great eyeliner... will have to be on a look out for this one!!! Thanks for the review! Please check your mail. I've a request. I so wish they launch in India.........**sends a quick prayer to all the Makeup Gods out there"
Wow. nice artwork you had there! haha. I've just bought it today hopefully it wont disappoint me.